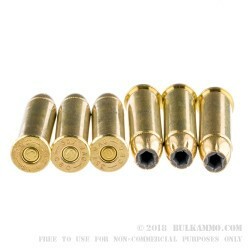 As you likely know, .357 mag ammo is a hard-hitting round that began the start of the “Magnum Era” of revolver cartridges. Magtech has been manufacturing its own components since 1926 and is a brand that has global recognition. They take pride in their ability to provide quality products at an affordable price for the consumer. 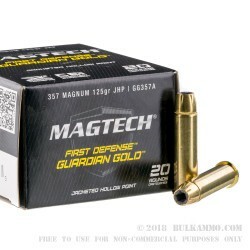 This Magtech .357 Mag ammo is no exception, being produced and tested in one of the largest small arms manufacturing facilities in the world, it offers a high-performing option for either self-defense or hunting. 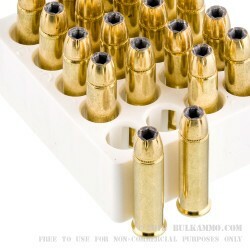 These 357 MAGs come 20 rounds to a box, are 125 grain, JHP (Jacketed Hollow Point) with a non-corrosive, boxer primed brass case. 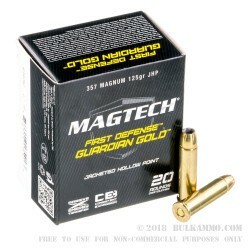 As an added bonus, these cartridges are reloadable! With a muzzle velocity of 1378 feet per second and muzzle energy of 527 foot-pounds, they will no doubt take down your prey or the bad guy. The .357 S&W Magnum cartridge was created by Elmer Keith, Phillip Sharpe and D. B. Wesson. It was first produced in 1934 in direct response to the Colt .38 Super Auto round but wasn’t available for purchase until 1935.